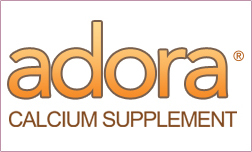 At the Fence: Adora Calcium Supplements! How many of you have ever tried Adora? Now, as I am getting older I am actually beginning to wonder if I am getting all the needed vitamins and such that I need. Calcium is important, but do you realize that it is important throughout your entire life? Even Teens and younger children need calcium. Now, I don't know about you and your children, but mine much prefer chocolate over pills or tablets! with 4 teens in the home, all of them need the calcium. They are extremely busy between work, Tae Kwon Do, racquetball, volleyball and all their other activities, I want to know they are getting their daily requirements. With Adora, my one son asks to have his! I do have to monitor that they don't treat them as candy. 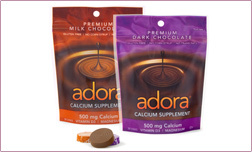 Adora Calcium Supplements come in milk chocolate and dark chocolate flavors. 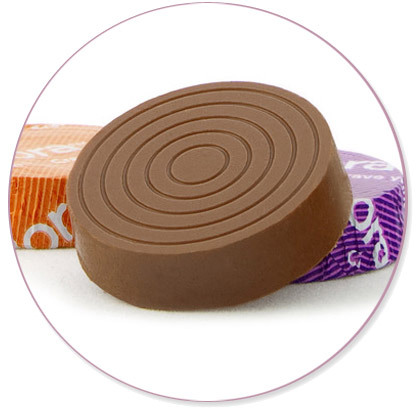 After over a century of perfecting the art of chocolate moulding, the team at Thompson Brands believed chocolate offered more than just great taste. 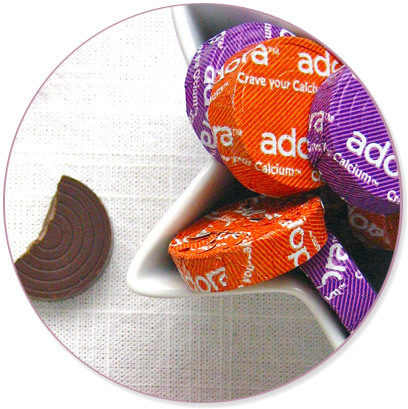 Enter Adora® - and the idea of craving your calcium! Adora Calcium Supplements were introduced to the world in 2006 in all-natural, premium milk and dark chocolate, and designed so that two delicious disks a day provide 100% of the Daily Value of calcium plus the addition of vitamin D3 for improved bone health and magnesium for optimal absorption. And, the proof is in the chocolate - as recent studies continue to report, adequate calcium and vitamin D throughout life, as part of a well-balanced diet, may reduce the risk of osteoporosis. Do you take a calcium supplement? One neighbor will receive one bag of Adora Milk Chocolate Calcium Supplements and one bag of Dark Chocolate Calcium Supplements. We drink a lot of milk and dairy. Dairy products and a daily supplement...these look tasty! I'm supposed to be taking supplements but I've gotten so off track. I think these would be a huge help! I try to drink a glass of milk every day. I drink a glass or two of milk daily. We eat lots of dairy products - plus I use Adora products. The Milk Chocolate flavor is my favorite! I take a calcium supplement along with eating a yogurt daily.